Welcome to the Math Salamanders Convert Decimal to Fraction support page. 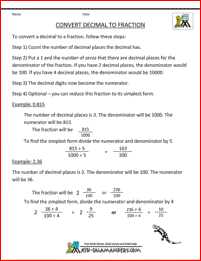 Here you will find information and support about how to convert a decimal number into a fraction. Here you will find some simple information and advice about how to convert a decimal to a fraction. Before you learn how to do this, you should also know how to simplify fractions. At the bottom of this page you will also find a printable resource sheet and some practice sheets which will help you understand and practice this math skill. If you want to convert a decimal into a fraction, please use this link to our decimal to fraction calculator. The calculator will convert any decimal to a decimal fraction, and also display the fraction in simplest form. Using the calculator is a great way of self-checking your work to help you with your decimal and fraction learning. This short video clip shows how to convert a decimal into a fraction. Step 1) Count the number of decimal places the decimal has. Step 2) Put a 1 and the number of zeros that there are decimal places for the denominator of the fraction. If you have 2 decimal places, the denominator would be 100. If you have 4 decimal places, the denominator would be 10000. Step 3) The decimal digits now become the numerator. Step 4) Optional - you can reduce this fraction to its simplest form. The number of decimal places is 3. The denominator will be 1000. The numerator will be 815. To find the simplest form divide the numerator and denominator by 5. The number of decimal places is 2. The denominator will be 100. The numerator will be 36. Here is a printable version of the support sheet. Here you will find two printable sheets where you can practice your math skills at converting decimals to fractions.